When Buffalo Bill Cody died in 1917, he was the best-known person on earth. But the world wasn&apos;t done with him. In this richly wrought novel, Richard Wheeler depicts the struggle to commandeer his remains for commercial purposes.The owner of the Denver Post, Harry Tammen, wanted to bury him outside of Denver, as a tourist attraction. Cody wanted to be buried in his namesake town, Cody, Wyoming. His estranged wife Louisa had other ideas, and so did his sisters. So did Cody&apos;s friends. The result was a gaudy free-for-all, in which Tammen prevailed, and the old scout was finally buried on Lookout Mountain, outside of Denver.The author gives us a telling look at the sycophants and connivers who surrounded the showman. He paints a tender portrait of the old man, who was besieged by a lot of people with a lot of schemes. Cody had many friends, including Annie Oakley and Sitting Bull, who remembered the old man fondly, and these people, too, have their say in this penetrating and sometimes comic novel. And in the end, Buffalo Bill emerges as a hero, a man better than many of those who surrounded him. 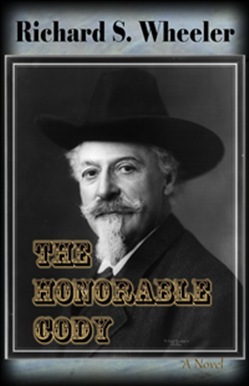 Acquista The Honorable Cody in Epub: dopo aver letto l’ebook The Honorable Cody di Richard S. Wheeler ti invitiamo a lasciarci una Recensione qui sotto: sarà utile agli utenti che non abbiano ancora letto questo libro e che vogliano avere delle opinioni altrui. L’opinione su di un libro è molto soggettiva e per questo leggere eventuali recensioni negative non ci dovrà frenare dall’acquisto, anzi dovrà spingerci ad acquistare il libro in fretta per poter dire la nostra ed eventualmente smentire quanto commentato da altri, contribuendo ad arricchire più possibile i commenti e dare sempre più spunti di confronto al pubblico online.